In a few days time it will be all systems go! On 18 October 2014 Engadin St. Moritz will be the first resort in Graubünden to launch into the winter season, which will be defined entirely by the anniversary marking 150 years of winter tourism. In winter 2014-2015 St. Moritz and the Engadin will be celebrating St. Moritz as the birthplace of winter tourism with numerous events. The grand Snow Sports Opening from 5 to 7 December 2014 marks not only the launch of the anniversary year, but also the celebrations of 150 years of winter tourism in St. Moritz. On Saturday and Sunday various makes of skis and snowboards will be put to the test at the grand ski and snowboard equipment test on the Corvatsch. On Friday evening and on Saturday the ski slope will relocate to the pedestrian zone of St. Moritz Dorf. This is where the St. Moritz City Race will see celebrities, guests and locals competing against one another at a ski cross event combined with a cross-country skiing circuit through the heart of the village. On Saturday evening St. Moritz Dorf will once again provide the setting for dazzling anniversary celebrations, featuring a Willy Bogner show retrospective of the last few decades, the anniversary film, impressions from the past 150 years of winter tourism, and the international musician Xavier Naidoo. The exciting anniversary programme will run through the entire 2014-2015 winter season, from 5 December 2014 to late April. Highlights include the book Snow, Sun and Stars. How Winter Tourism Conquered the Alps from St. Moritz, published in English and German by NZZ-Verlag and edited by the municipality of St. Moritz and its civic community. An anniversary film and an anniversary magazine with a circulation of 20,000 copies all focus on the pioneering spirit of the founding fathers and highlight the way in which winter tourism has evolved in the Engadin. The new Fun Slope at the Corviglia Snow Park guarantees lots of fun and fast turns, alongside all the various obstacles and ‘kickers’. The Murtèl middle station on the Corvatsch has one of the largest snow parks anywhere in Switzerland and the only half-pipe in the Engadin. Pros and fun boarders alike are guaranteed to find the right run to suit their style. The Corvatsch Snow Park is to be expanded further this winter. And there’s plenty on offer for adrenaline junkies on the slopes, too. With a gradient of 86% the Minor Piste on Lagalb is the steepest downhill run anywhere in Graubünden, and once the season gets underway on 20 December 2014 it is prepared as soon as snow conditions permit. The Corvatsch offers a chance to go snowshoe hiking along marked trails high above the Engadin lake landscape. Besides the existing Lake Trail, which loops in a large circuit from the Furtschellas middle station (2312 m) and back again and offers magnificent views, the new Peak Trail runs from the Furtschellas mountain station (2800 m) through an unspoilt winter landscape back down to the Furtschellas middle station. A fascinating snowshoe hiking experience is also available on Muottas Muragl. Since the last winter season the two-hour 3 winter hike on the Philosophers’ Trail on Muottas Muragl has had a new feature: benches complete with woollen blankets provide a welcome break and an opportunity to ponder the aphorisms of eminent philosophers signposted along the Trail. In 2014 the Kempinski Grand Hotel des Bains will also be celebrating the 150th anniversary of its opening as the Kurhaus & Grand Hotel, St. Moritz Bad in April 1864. Along with the Kulm Hotel St. Moritz, the Kempinski Grand Hotel des Bains is therefore the second oldest luxury hotel in St. Moritz. Together with the five-star hotels Kulm Hotel St. Moritz, Carlton Hotel St. Moritz, Badrutt’s Palace Hotel and Suvretta House, it is one of the Big Five, renowned all over the world. The Badrutt’s Palace Hotel is opening its new restaurant Matsuhisa@Badrutt’s Palace / La Coupole, located in what was once, in 1913, Europe’s first indoor tennis court and is now set to become the new restaurant of world-famous star chef Nobuyuki Matsuhisa in St. Moritz. On 23 to 25 January 2015 the Badrutt’s Palace Hotel is also reprising its new music festival, which was held for the first time in September 2014. The Sinfonia Amadei Orchestra under conductor Lukas Christian Reinitzer will be delighting guests and local residents alike with works by Ludwig van Beethoven. At the Carlton Hotel St. Moritz a new executive chef will be welcoming guests to the Restaurant Romanoff. From the start of the season Gero Porstein, previously sous-chef at the restaurant, is to become its executive chef and assume responsibility for the five-star hotel’s culinary highlights. The stellar events held on and alongside the frozen lake of St. Moritz in January and February are an important part of the winter event schedule in St. Moritz. The events on offer in St. Moritz are as varied as they are numerous: whether it’s the St. Moritz Snow Polo World Cup, the spectacular races at the Bob and Skeleton European Cup, the St. Moritz Gourmet Festival (this year’s motto is ‘British Edition’, entirely in keeping with the anniversary marking 150 years of winter tourism), or the White Turf Horse Race. As indeed are those in the Upper Engadin. The classic cross-country skiing endurance race La Diagonela, one of the races in the Swix Ski Classics series, is to be held in the Upper Engadin for the second time on 17 January 2015. Elite athletes and amateurs alike will compete on an attractive trail of either 30 km or 65 km. The weekend of 13 to 15 March 2015 has two treats in store. The Corviglia will be playing host to the St. Moritz Music Summit, Europe’s highest club music festival, with internationally renowned DJs, while the world’s best freeskiers will be showing off their skills at the Corvatsch Snow Park at the FIS Freeski World Cup Corvatsch. For an overview of all these top events go to www.engadin.stmoritz/topevents. The Mountains. The Horizons. The Light! Engadin St. Moritz is delightful as both landscape and legend. With four major peaks and 350 km of pistes with guaranteed snow, 150 km of hiking trails and more than 220 km of cross-country trails, Engadin St Moritz is recognised as one of the biggest and most beautiful areas for winter sport in Switzerland. The wide array of sports and leisure activities on offer, the specialities of its regional cuisine, the wealth of cultural activities, and the multitude of events inspire and enthral its guests. The region owes much of its appeal to St. Moritz, the scintillating alpine destination, on the one hand and the Engadin, 4 the inspirational high-alpine valley, on the other. 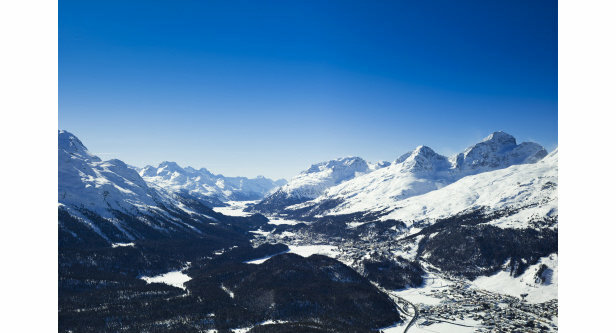 But the star attraction in Engadin St. Moritz is and remains nature itself. Benefiting from all the space it needs to flourish and prosper, it offers in return boundless opportunities for visitors and guests to enjoy the natural setting.